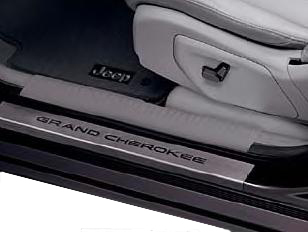 Here's an accessory from JustforJeeps.com that's easy to install, protects a high-wear area of your Grand Cherokee and provides a finished, upscale look all at the same time. These door entry guards fit over the interior door sills to protect them from scuffs and scratches. 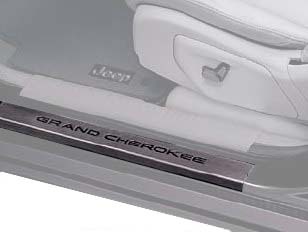 They're made of stainless steel and the front door entry guards feature the Grand Cherokee logo. They're sold in sets of two, front or rear. Installation is simple and requires no drilling. Add protection and good looks with door entry guards for your Grand Cherokee. These pieces were the right dress-up item for my Jeep. Instructions were easy and quick to apply. Thanks!